Adriana Saipe became emerged into the world of Ketubahs like many other artists — looking for a Ketubah for her own wedding. Not only was she looking for a Ketubah to match her style, but something Interfaith as well. Realizing a need for more Ketubahs that were not only more inclusive, but “simple, contemporary, and colorful” — Ink with Intent was born. At first glance, we could tell that Adriana was a true artist with an eye for detail, color, and balance — and her website was a true testament to that. Easy to navigate and completely user-friendly, each page contains helpful information for text options, designs, and overall ordering. 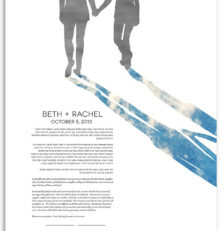 Her Ketubah designs contain a range of silhouettes, simple themes, and watercolor styles. From what Noah and I could tell Ink with Intent seems to be one of the newer Ketubah artists out there, so unfortunately there wasn’t a huge range of text and design options. Over all we definitely fell in love with Adriana’s Ketubah styles! It’s refreshing to see something different and more intentionally simple, but still vibrant and stunning in its own way. From Adriana’s approach to creating Ketubahs to the gorgeous pieces that make up her gallery, Ink with Intent has definitely been one of our favorites!